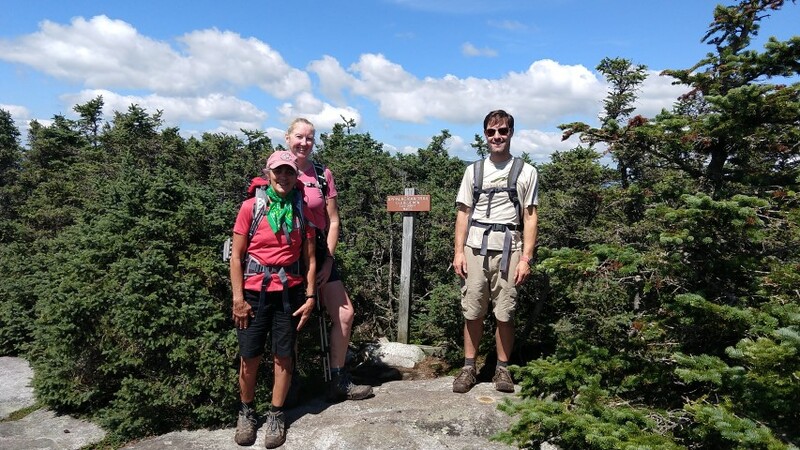 Guthook tells us how to maintain the Appalachian Trail. 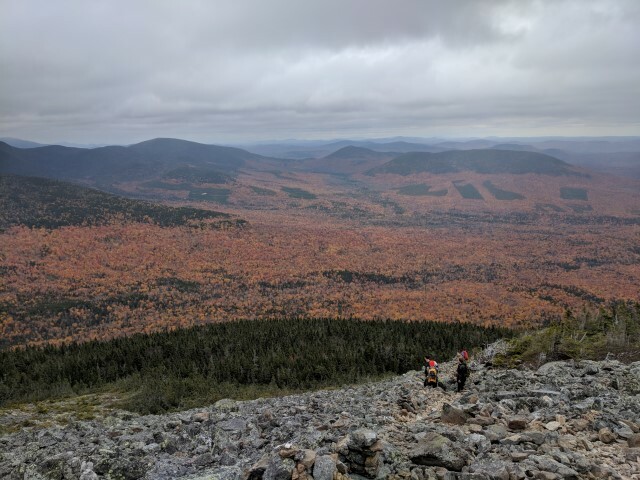 Hiking up any one of Maine’s most prominent mountains during peak foliage is a sight to behold – but especially true on Mt. Abraham! Our group tackled the 9-mile roundtrip hike this past Saturday and were treated to a brilliant display of reds, yellows, oranges and greens. After a quick briefing the group headed off, enjoying the winding trail and basking in the golden colors of the fall. At these lower elevations a prominent of ash, birches and elm produced vivid yellow colors in addition to the brilliant red and scarlet of maples, various oaks and sumac. We hopped across several streams, careful to keep our boots dry. The Mt. Abraham trail was in great condition, thanks in part to MATC trail maintainer Ryan Linn who we ran into on the hike, preparing for the coming spring melt by ensuring water bars were clear and properly functioning. After two and a half hours we reached treeline to take in the magnificent landscape and its views. The demarcation line of evergreens versus deciduous species was clearly evident. A short while later after rock-hopping across the scree slopes of Abraham we reached the windy summit. 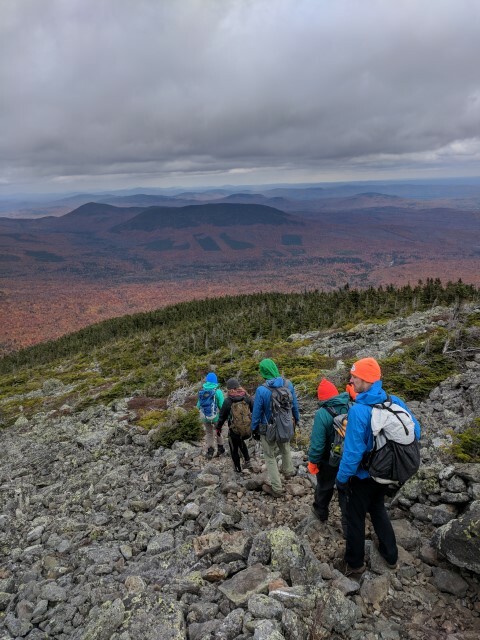 Off in the distance the group marveled at various snowbursts across Maine’s High Peaks and recharged with various snacks, including Maine-based Redd bars donated for the group (ed note: the salted caramel really hit the spot, thanks Redd!). MATLT Executive Director Simon Rucker gave a brief history of the area, including pointing out various current and future projects. He noted the old fire warden’s tower, which had been repurposed into a makeshift shelter that had recently been dismantled by Maine Youth Trail Stewardship Coalition (thanks guys!). The remains will have to be airlifted out at some point. As the chill began to set in we set off down the mountain, enjoying the views all the way down. It was a quick, technical descent by some very capable hikers! On the way there were short bursts of snow & sleet. After reaching the trailhead it was decided that tacos were on the minds of this very hungry hiking crew so we celebrated another successful summit at Uno Mas in Farmington. 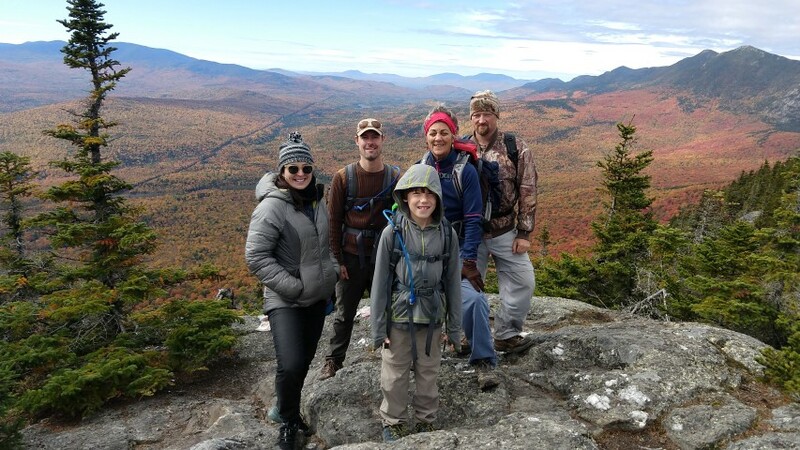 Another great hike in Maine’s glorious High Peaks! 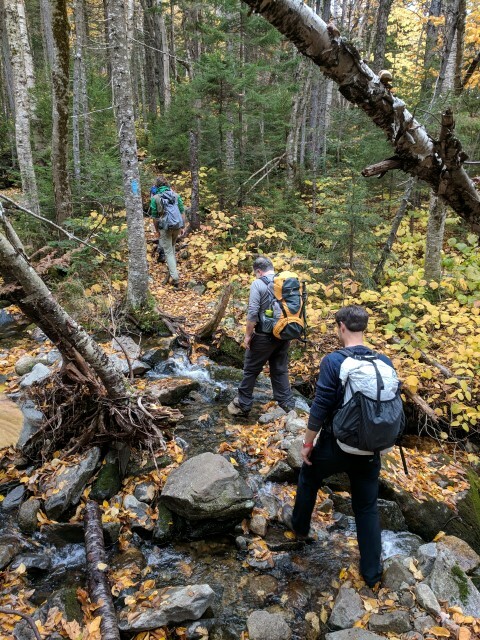 The Maine A.T. Land Trust will be posting our winter hike schedule soon – be sure to check back in for updates and sign up for our next adventure! West Peak, Avery Peak and the Horns. A chilly but scenic lunch. Beautiful fall day – check. Nicely-maintained trail – check. Good group focused on being out in both – check. We had it all on the latest Maine A.T. Land Trust hike up Little Bigelow, the little robust mountain just to the east of the larger peaks (West, Avery and The Horns). 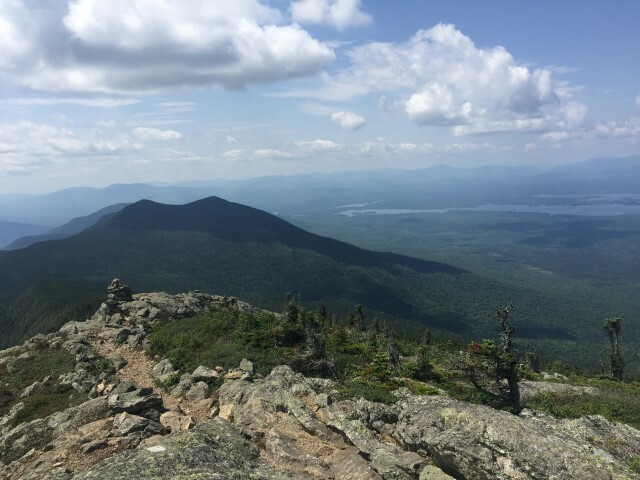 The summit is only 3,060 feet, the approach is over open but gradual ledges that provide great views of Flagstaff Lake and the eastern mountains along the A.T. towards the 100 Mile Wilderness. The route starts out at the very southeastern tip of Flagstaff Lake, where the A.T. exits the Bigelow Range and heads over to the Carry Ponds. We headed west (southbound on the A.T.) and very soon encountered the first of MANY northbound A.T. through hikers. The trail winds through a mixed hardwood – spruce/fir forest and the leaves were popping with color. The trail does not ascend very steeply until reaching the ledges, but at that point the views more than compensate for the elevation gain. The sun peeked out from behind the clouds once in a while. About two-thirds of the way up, we had our first and only view of the summit of Little Bigelow. It looks far away at that point but we made it to the summit only twenty minutes later. On top, we joined an already large group of day hikers that only grew as the day went on. In the valley below the Bigelows there were yellows, reds, oranges and everything in between on the peak foliage. 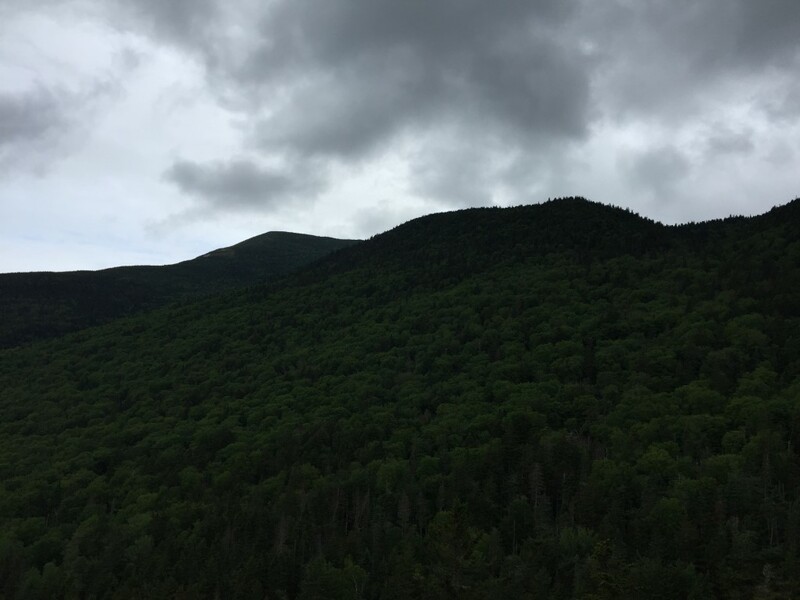 The summits ringing the view – Sugarloaf, Spaulding, the Crockers, Redington, and the Bigelows – were dark with conifers. It was cold, but worth it! The Maine A.T. Land Trust will be posting our winter hike schedule soon! Little Bigelow might be on that list…check back soon. sensitive alpine ecosystem by concentrating hikers to one path and keeping boots from damaging high elevation trees, shrubs, lichens, and moss. Although cairns are cool and fun to build, stewards learned that they should only be constructed where they will help trail users navigate and generally under the trail manager’s discretion. Building cairns on beaches or at waterfalls, for example, takes away from the experience we look for when visiting such pristine natural places. 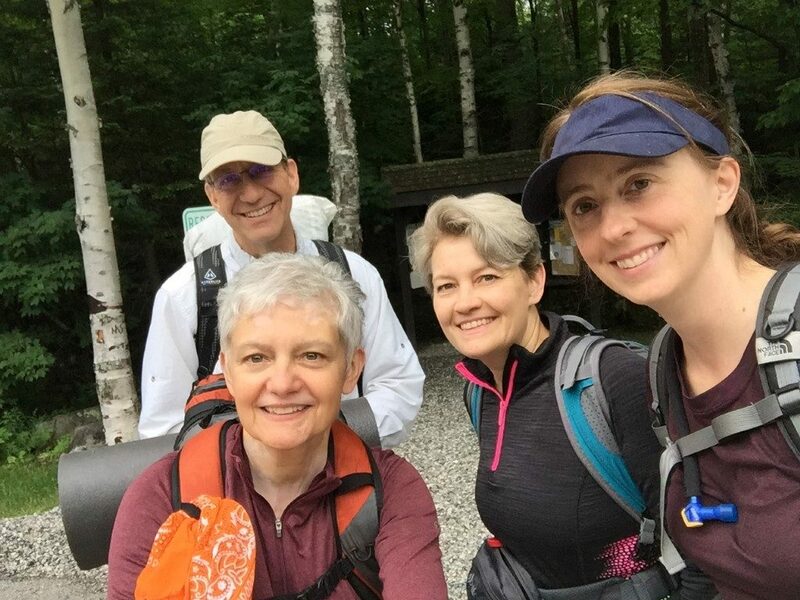 2019 where trail leaders teach valuable techniques for building and maintaining recreational trails. 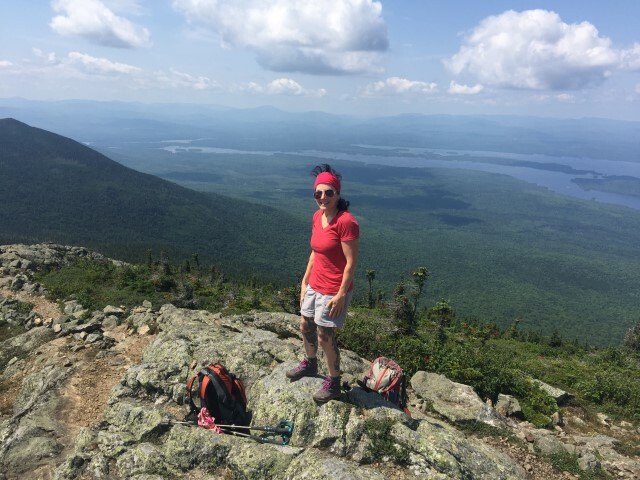 Savannah is the Trails Manager for Maine Huts & Trails and a great friend of the Maine Appalachian Trail Land Trust! Maine Historical Society folks along with some A.T. regulars. Route towards the Appalachian Trail. Middle Carry Pond, where the expedition crossed the pond. Norm tells it like it was. AEHS cabin on Middle Carry Pond. Members can use it! 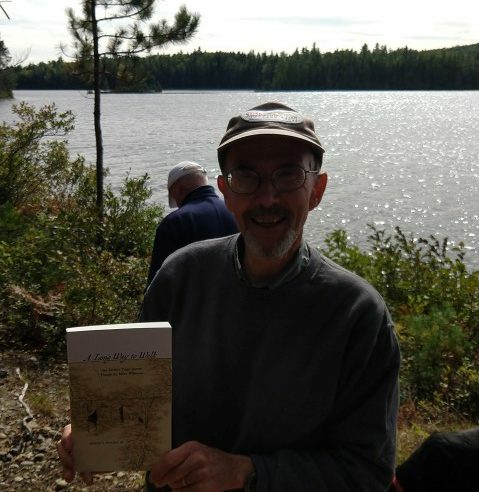 AEHS guide Norm Kalloch with his new book, “A Long Way to Walk”. 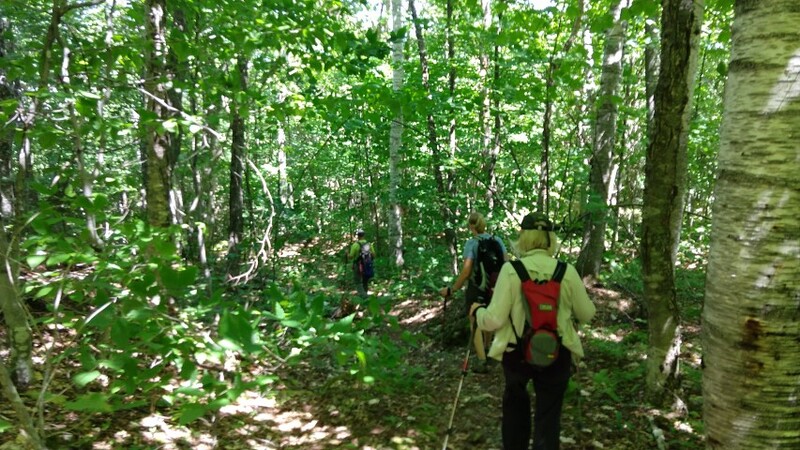 The Maine Appalachian Trail Land Trust’s latest community hike was a good one: a partnership outing on the Arnold Trail with both the Arnold Expedition Historical Society and the Maine Historical Society. In the fall of 1775, Colonel Benedict Arnold led a detachment of 1,100 American soldiers through the Maine and Canadian wilderness in what was intended to be a coordinated, secret attack on the British army fortified in Quebec City. The overland route would follow a Native American trade route along the Kennebec and Chaudiere Rivers, using the Great Carrying Place Portage Trail through the Carry Ponds. About 600 soldiers made it through the wilderness, encountering horrendous storms, flooding, disease and starvation before reaching the St. Lawrence River across from Quebec City. 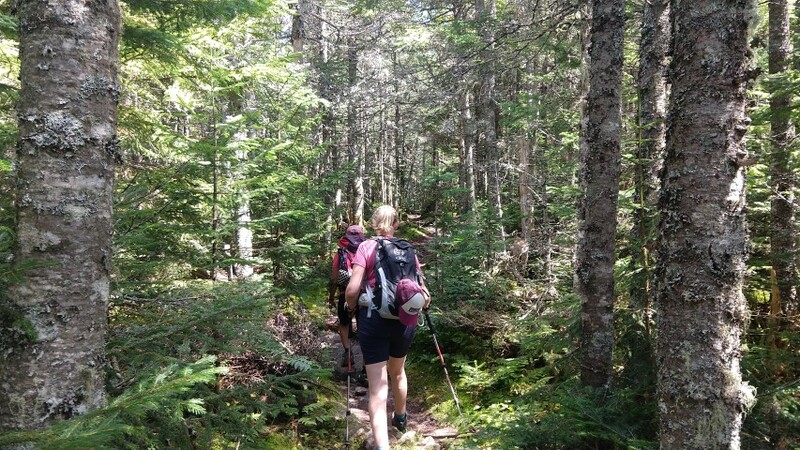 The area between the Carry Ponds, between Flagstaff Lake and the Kennebec River, is home to both the Appalachian Trail and the Great Carrying Place Portage Trail. Both string the ponds together like a necklace and both use the original route of the Arnold expedition as a footpath in places. We headed out at 10am, planning to reach the area between East Carry Pond and Middle Carry Pond. It was a beautiful day with temperatures of about fifty degrees at the start and warming up throughout the day. Most of the group participants were members of the Maine Historical Society but there were a few A.T. attendees. 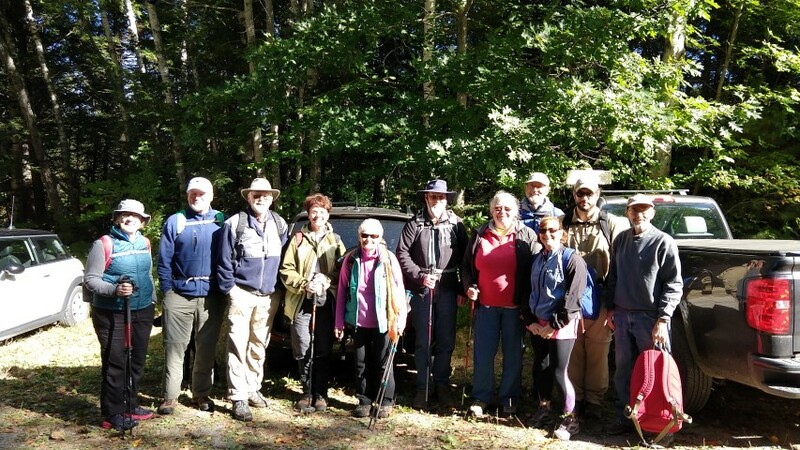 Norm Kalloch, AEHS board member and a resident of West Carry Pond, has been gracious enough to lead a hike for us annually, providing great insight into a landscape that in some ways has changed, but in many remains as it was in the time of the American Revolution. Norm’s knowledge of the area and the history is amazing and he truly makes this hike the great event it is. The group made it to the AEHS cabin on Middle Carry Pond by lunchtime, and after a quick stop at the hospital site, headed back to the cars. 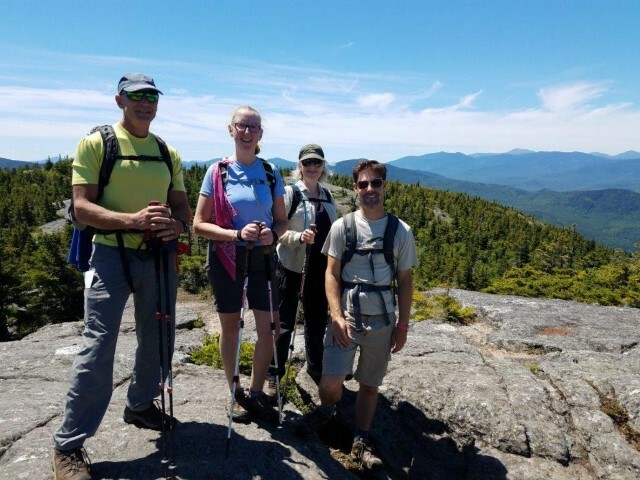 It was a great day out in the field to see all that the Maine Appalachian Trail region can offer – not just the A.T., but history, partnership and dedication to Maine! Saturday, August 25th proved to be the perfect day for hiking Caribou Mountain. 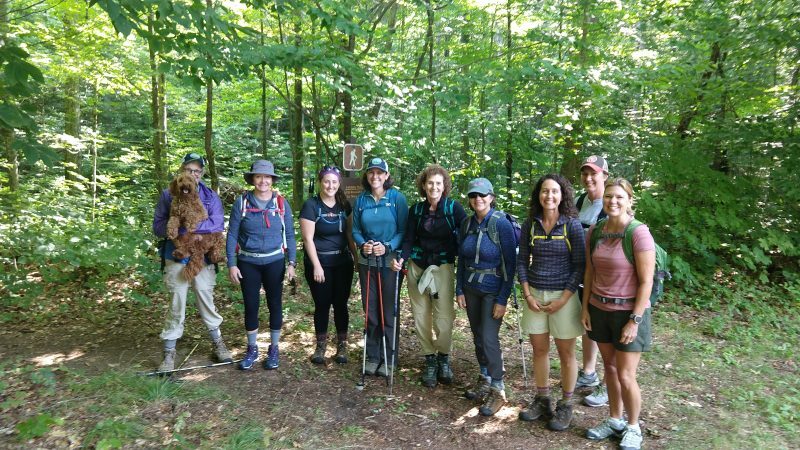 Nine LAC adventurers with their knowledgeable guide Simon Rucker (Maine Appalachian Trail Land Trust), and trail dog Callie, hiked the Caribou Trail to the summit. The trail crossed several brooks and streams that tested our balance while we traversed over the rocks, like we were playing nature’s version hopscotch. The soundscape of the forest was alive with rush of water flowing over the rocks. The trail climbed steadily to the summit affording us many rest stops (thankfully!) to enjoy the tranquility of the Caribou-Speckled Mountain Wilderness. At the summit (2850 ft.), we ate our lunches and were treated to the gorgeous sweeping views of the surrounding mountains. Simon pointed out each by name, including Mt. Washington. We took the Mud Brook Trail back down the mountain that was indeed, at times, muddy, much to Callie’s delight! We were awed by the many varieties and colors of mushrooms we saw along the trail, never tiring of the diversity. Every step confirmed that this was a wonderful day to be in the forest, and every laugh confirmed we were in excellent company! We all agreed that hiking Caribou Mountain was the ideal way to end the summer. Steep trail up from Black Brook Notch. Snow Valley down to Telstar. Flat spruce woods on the top of the notch. Blue hazy mountains to the west. 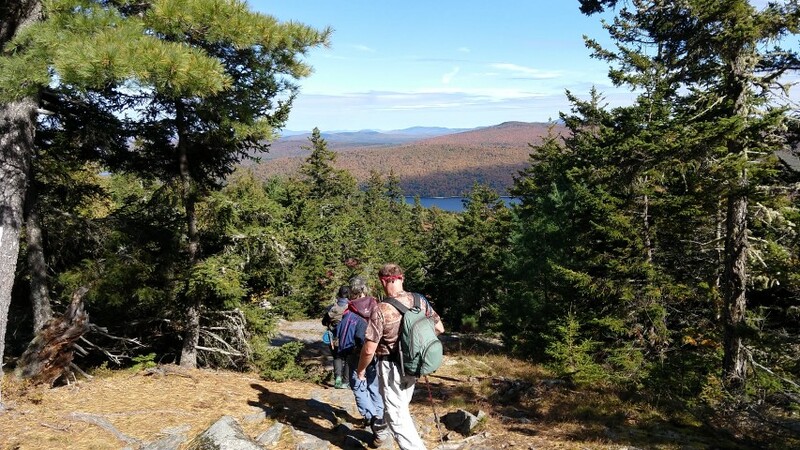 The latest Maine Appalachian Trail Land Trust community hike was up Old Blue Mountain in the vicinity of Andover, Maine. After exiting Grafton Notch the A.T. heads through a series of lower mountains and notches before reaching Black Brook Notch. This valley features a dramatic down one side of the notch (Moody and Sawyer Mountains) and an equally dramatic ascent up the other side – Old Blue Mountain. Our small group started from South Arm Road, where the A.T. very steeply ascends the notch wall for about half a mile before flattening out. 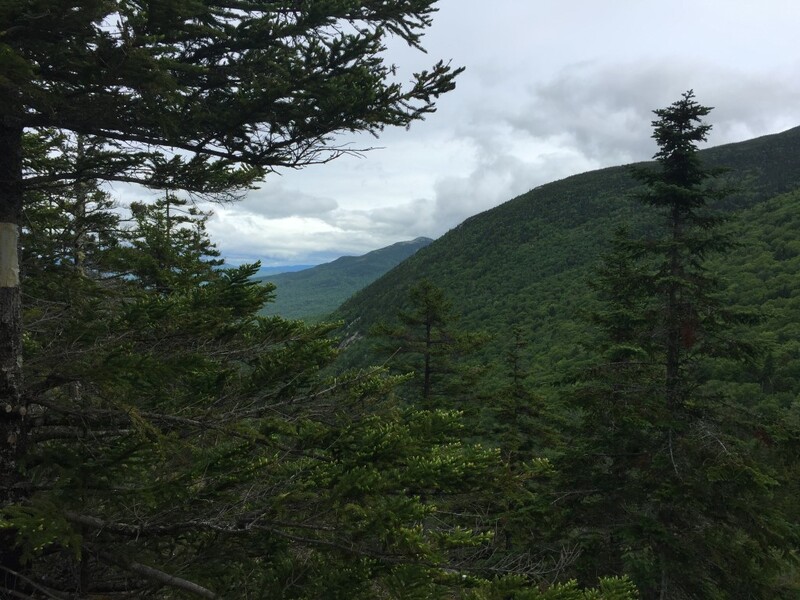 The views down Black Brook Notch into the Ellis River and Snow valleys show the sparsely populated Andover region. 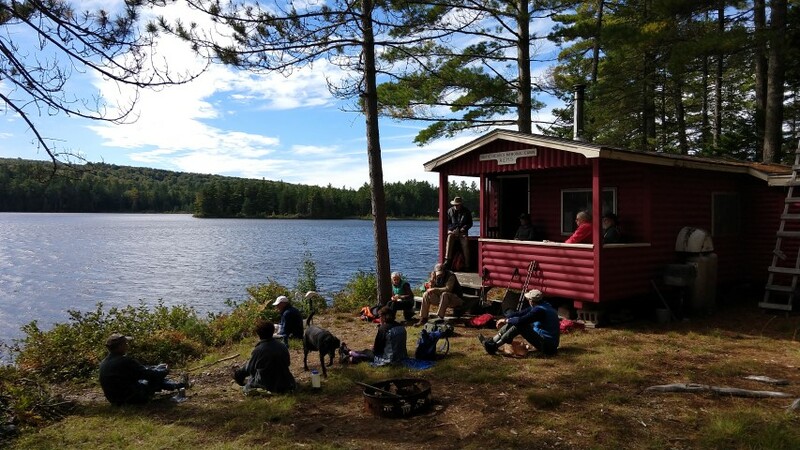 Many A.T. hikers stop in Andover and stay over at a local hostel and get some delicious food at The Little Red Hen (where this group stopped as well!). We continued up the trail towards Old Blue, sometimes heading up, sometimes down but mostly staying flat. After another 1.5 miles the trail again ascends up the steep-ish side of Old Blue, finally reaching the flat summit area at about 2.8 miles from South Arm Road. The summit is dominated by low spruce forest of about 3-6 foot trees, so your view will depend on how much you can look over their tops! To the north, the A.T. continues on, skirting Elephant Mountain’s flank and then proceeding up Bemis Mountain (location of the next A.T. shelter). 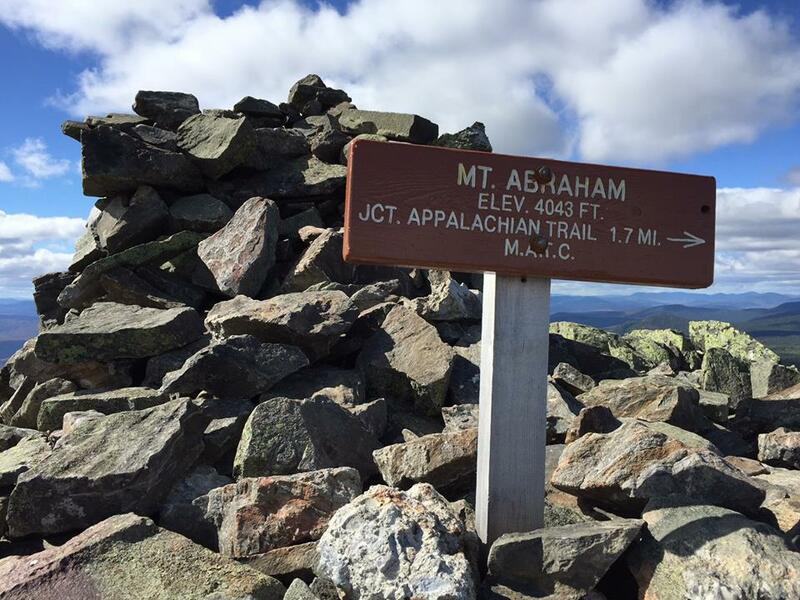 Well to the north, taller hikers can see Mount Abraham, Saddleback Mountain and others in Maine’s High Peaks region. To the west are the most dramatic views of Grafton Notch, the Mahoosucs and beyond to the White Mountains. 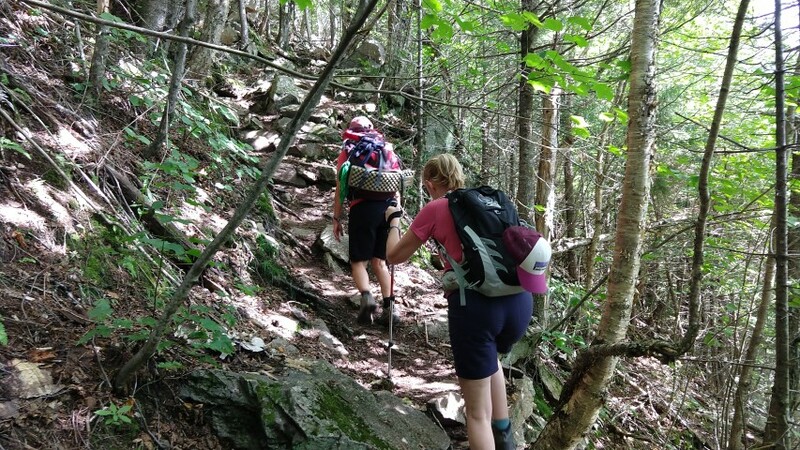 Our descent was relatively quick, as the steep parts of the trail have been masterfully constructed with stone steps by the Maine Appalachian Trail Club. 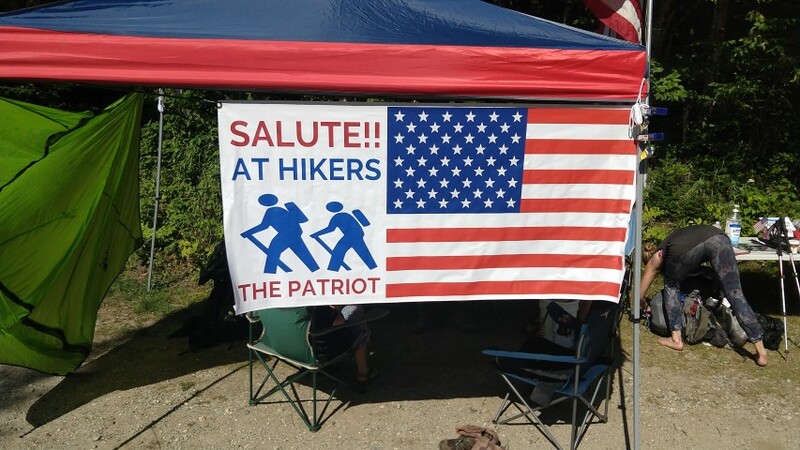 At the base, a well-known trail magic purveyor had set up and had several A.T. hikers with him for the evening! Join us for our next hike up the Crockers on September 9th! All of our community hikes are free and open to all. 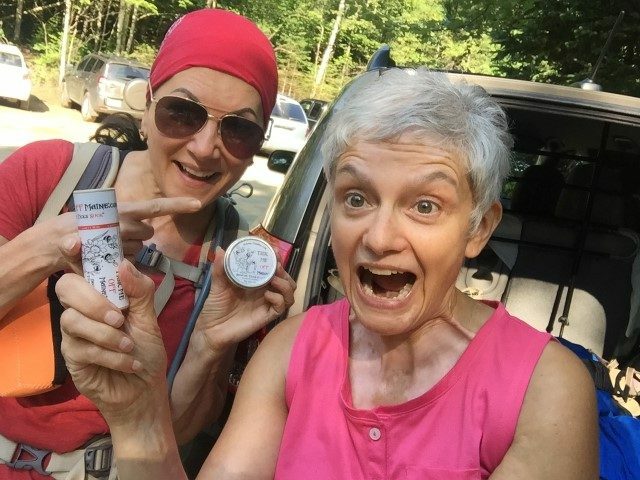 A postponed hike from a rainy Saturday to a hot and humid Sunday left only 2 hikers to travel up to the Bigelow Preserve in Western Maine. The State of Maine website describes the Preserve: Located in western Maine just east of the village of Stratton about 40 miles north of Farmington, Bigelow Preserve includes over 36,000 acres of public land. 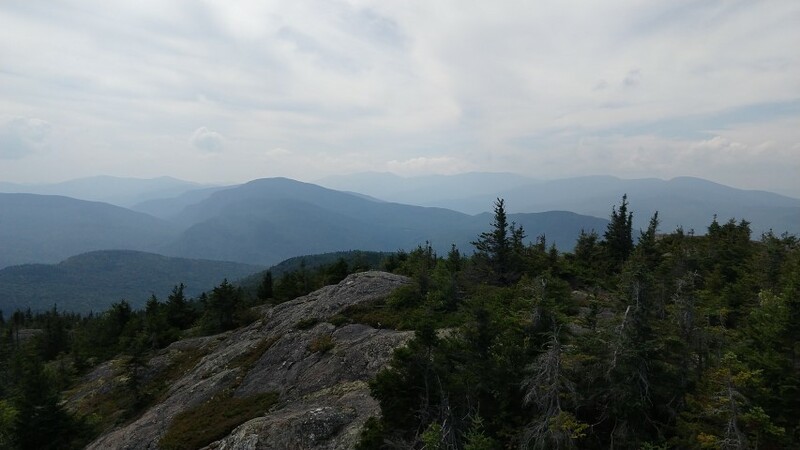 The preserve encompasses the entire Bigelow Range, which includes seven summits. The highest of these at 4,150 feet is West Peak, one of only 10* Maine summits over 4,000 feet in elevation. 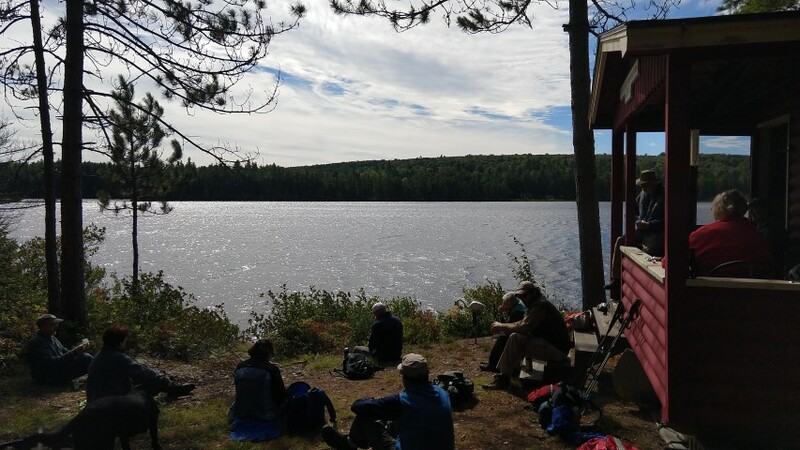 Bounded on the north by 20,000-acre Flagstaff Lake, the preserve offers many opportunities for outdoor recreation. The hike was a loop featuring 2 peaks this day, West Avery and South Horn, with a side visit to Horns Pond. We hit the trail just after 9 am and already the heat and humidity were rising steadily. Despite the conditions, we made it to Avery Col by noon, traveling via the Fire Warden’s Trail, the shortest route to reach Avery and West Peak. The last mile up to the col is a steep one, but we took our time and once there, we ate and relaxed on one of the tent platforms at the Avery Col campsite. Sufficiently fueled and rested, we soon set out on the AT for West Peak, only .4 miles away. Hikers descending from the summit promised us that we would finally find the cool breezes and lower temps that eluded us all morning and we were not disappointed. A refreshing breeze (we even layered up a bit!) 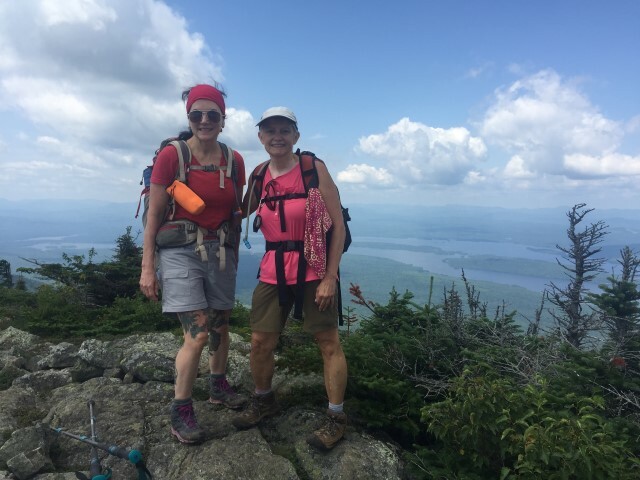 and hazy but oh so spectacular 360 views greeted us upon our ascent: Flagstaff Lake, Rangeley Lake, the Horns peaks, Avery Peak, Little Bigelow Ridge, Sugarloaf Mountain. 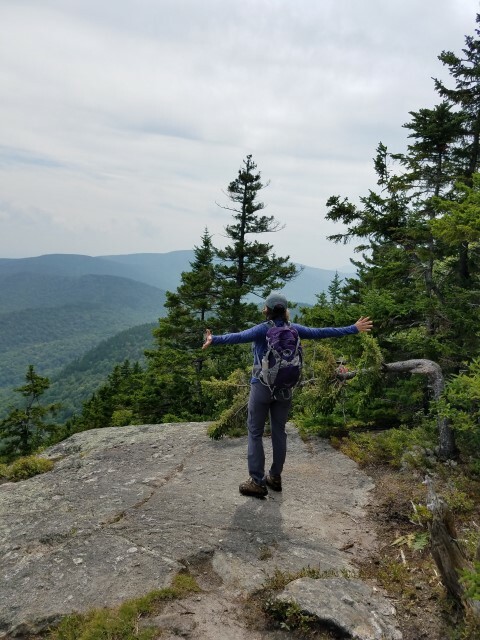 The Bigelow Traverse along the AT is considered by some to be one of the most scenic hikes in Maine, and this hiker is in total agreement. We spent a considerable amount of time soaking in the magnificent views, taking pictures and chatting with hikers (not many through hikers this day). We even admired the rather unusual piece of hiking attire sported by a young woman hiking with a nice group of Canadian backpackers: a life vest! “Safety first”, she said. I guess no one was going to drown in Horns Pond today! We still had a long way to go so we headed over to South Horn. We descended below tree line along a quiet and beautiful section of the trail. 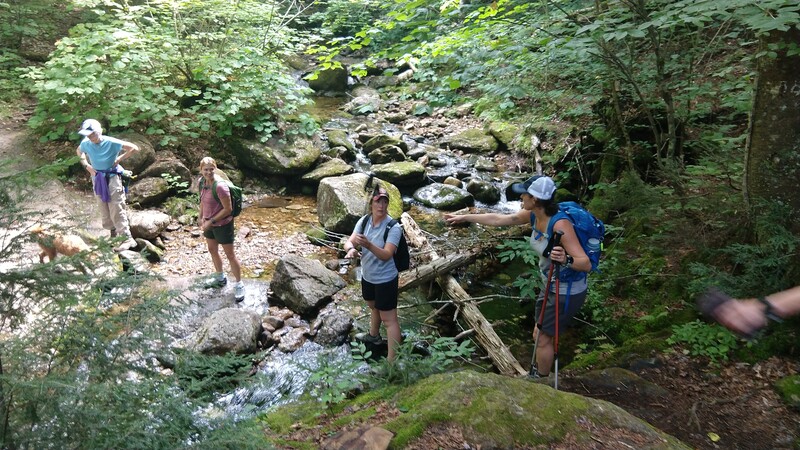 It was lush and green, with some easy footing, a relief from the rocky and bony pathways we hike so often in Maine. 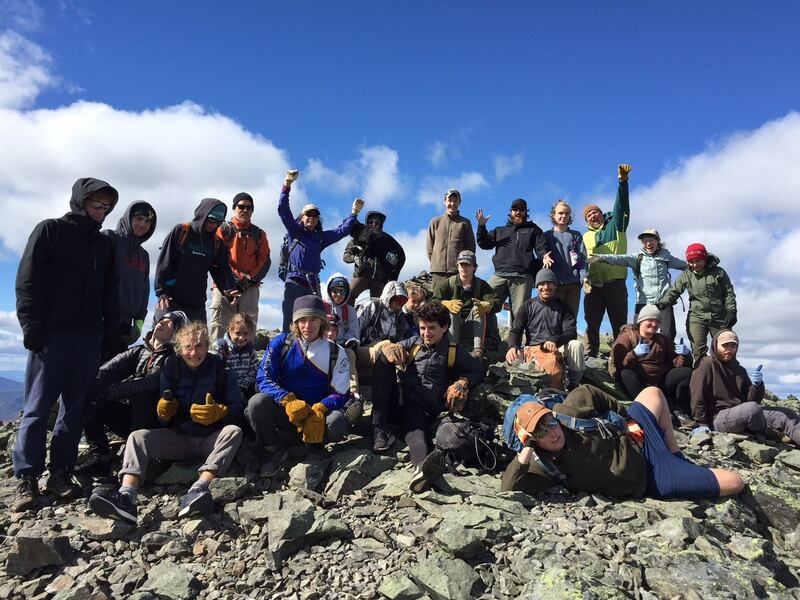 We ascended to the small conical summit of South Horn where we met the Canadian group again and took in a splendid view of Horns Pond, our next destination. We did not linger long and began our steep descent toward the Pond, passing up a trip on the spur to the North Horn as we still had a few hours of trekking ahead of us. In about a half mile or so we made it to the Pond where we took a short break, soaked feet, and admired this peaceful and lovely body of water nestled high up in the mountains. The peaceful part soon ended as our Canadian friends arrived and proceeded to strip to their undies for a refreshing dip. We contemplated doing the same as it was still hot and humid but we were heading out and they were staying the night. Note to self: next time pack a bathing suit (or at least an extra set of undies!). 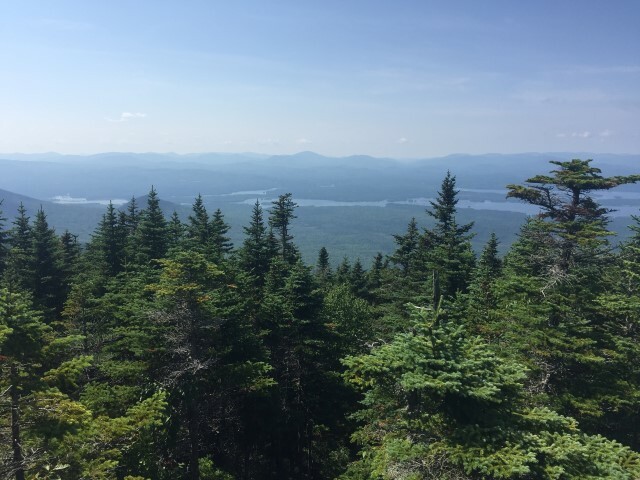 We completed our loop hike by turning left off the AT and descending gradually on the Horns Pond trail, passing by a beaver pond and through a stand of spruce, and then continuing down among the hardwood trees to Stratton Pond Rd. Along the way we met one of the MATC Ridge Runners who was on his way to the Horns Pond Campsite to check in on our Canadian friends and another group camping for the night. We finally arrived at the parking area just after 6 pm, tired but happy after 12 plus miles of hot, humid, beautiful and amazing hiking. 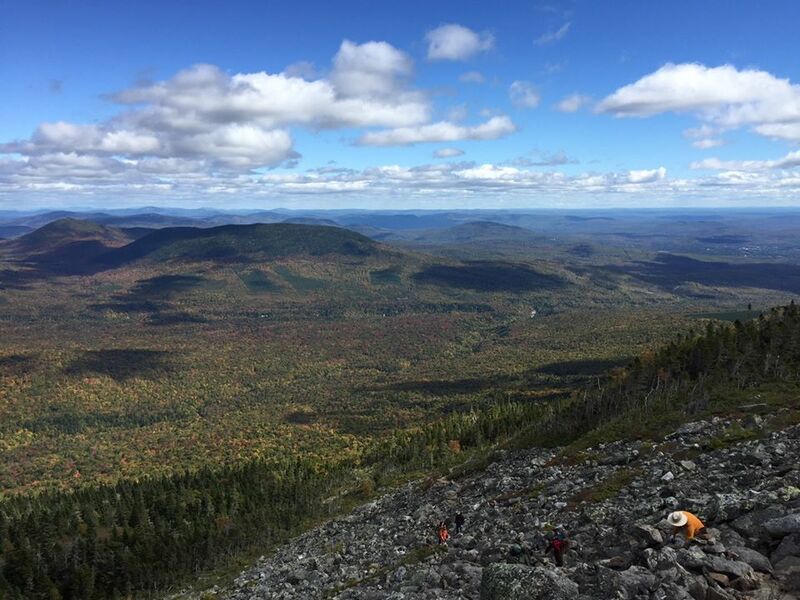 * There are 14 peaks in Maine listed as 4,000 footers. Bright sun low and high. 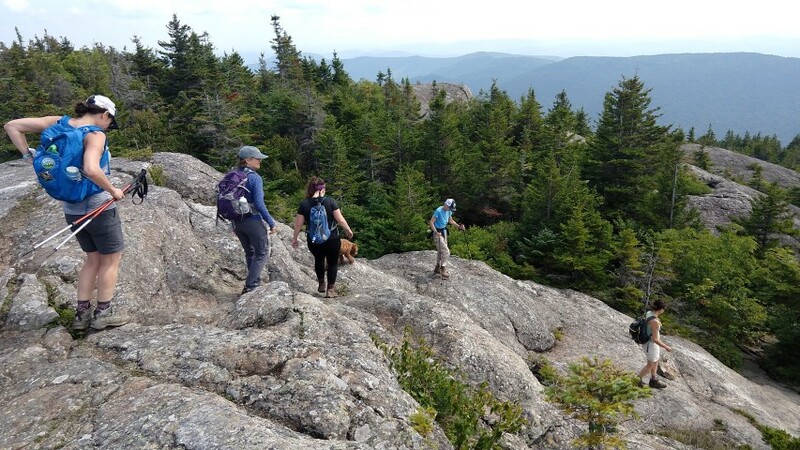 The Maine Appalachian Trail Land Trust had our latest community hike up Caribou Mountain in Evans Notch on a beautiful Saturday. 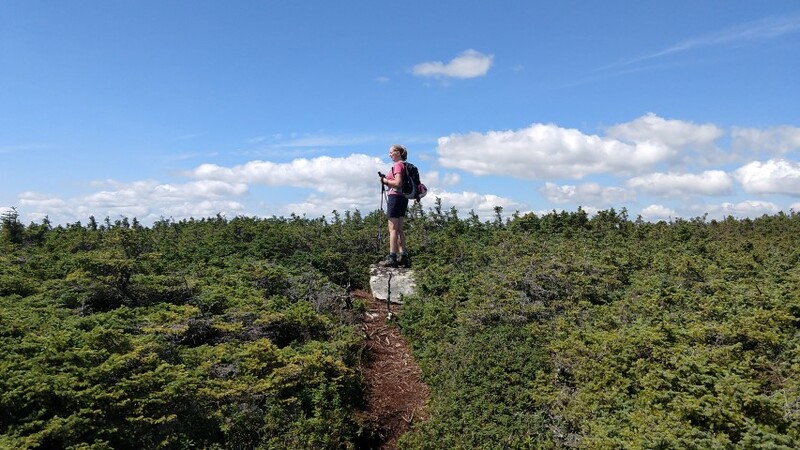 Our community hikes are designed to get people of all abilities out on the A.T. landscape and Caribou is a great one, winter or summer, due to its accessibility – it’s not too steep and not too far from most people. At the same time it’s a great hike! We started off on a beautiful day – sunny, 0% chance of rain, low humidity. 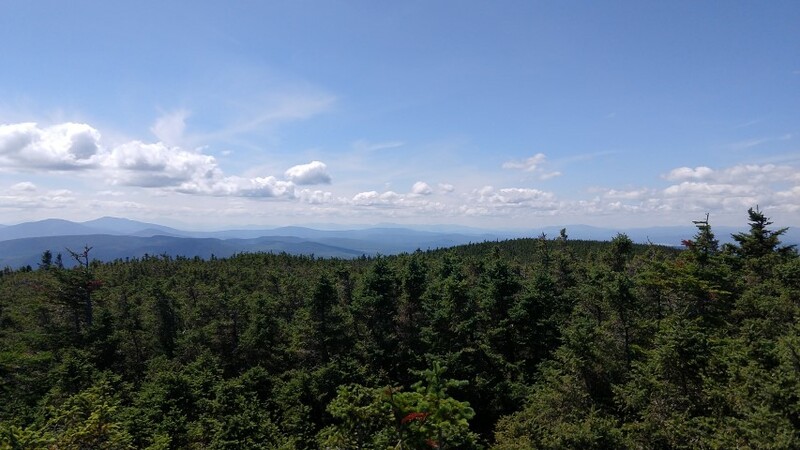 The trail up Caribou from Bog Road starts on old logging roads administered by the US Forest Service since the land is in the White Mountain National Forest. 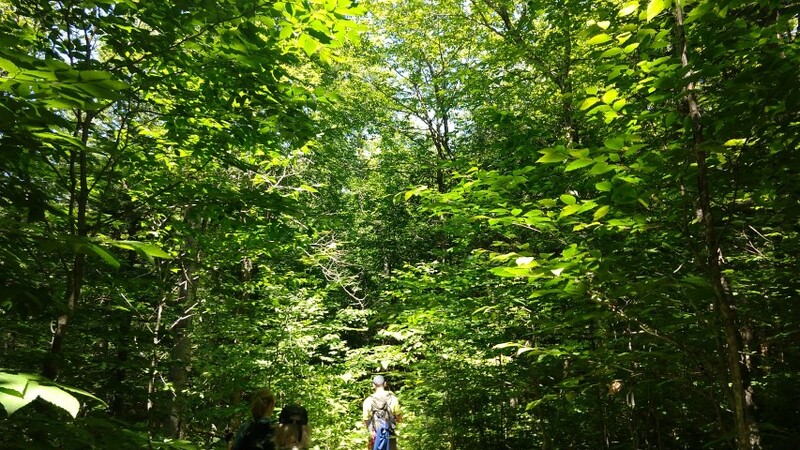 The mature forest canopy is mostly comprised of hemlock, maple, and birch, and the trail is open and inviting. 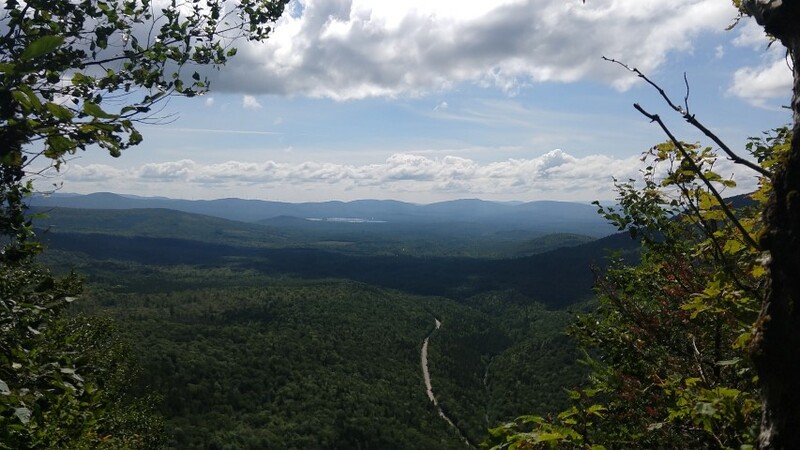 For the first half of the approximately three miles of trail, the ascent is gradual up to a ravine between Caribou and Gammon Mountain, just to the north. 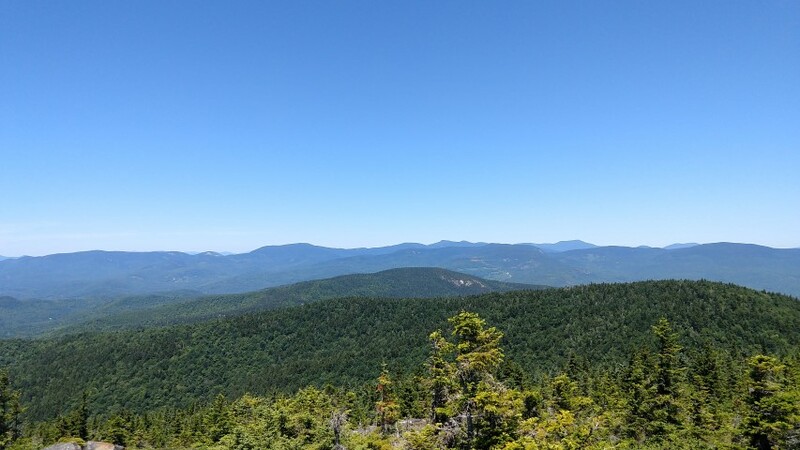 After crossing into the Caribou-Speckled Mountain Wilderness area, the trail intersects with the Mud Brook Trail and both merge and head south to the summit of Caribou Mountain. The forest abruptly transitions from hardwoods to spruce and fir, and suddenly we were in the boreal forest of mountaintops in the great north woods. 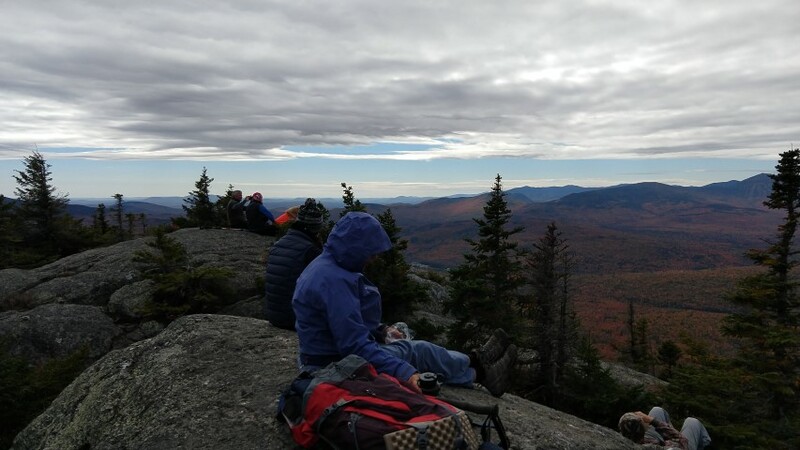 We came out on the summit area – complete with fragile alpine vegetation – and had views in all directions of some of the most spectacular mountain terrain in both New Hampshire and Maine. Directly to the west we could see the Carter-Moriah Range, with the Presidential Range looming directly behind them. 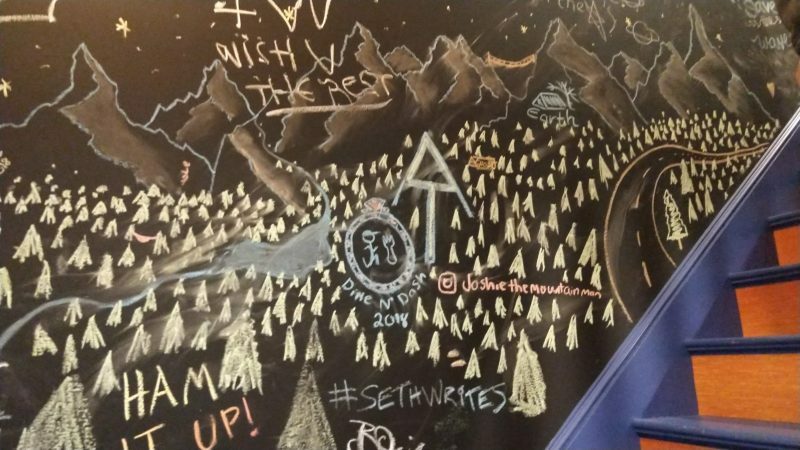 The Mount Washington Observatory was clearly visible. 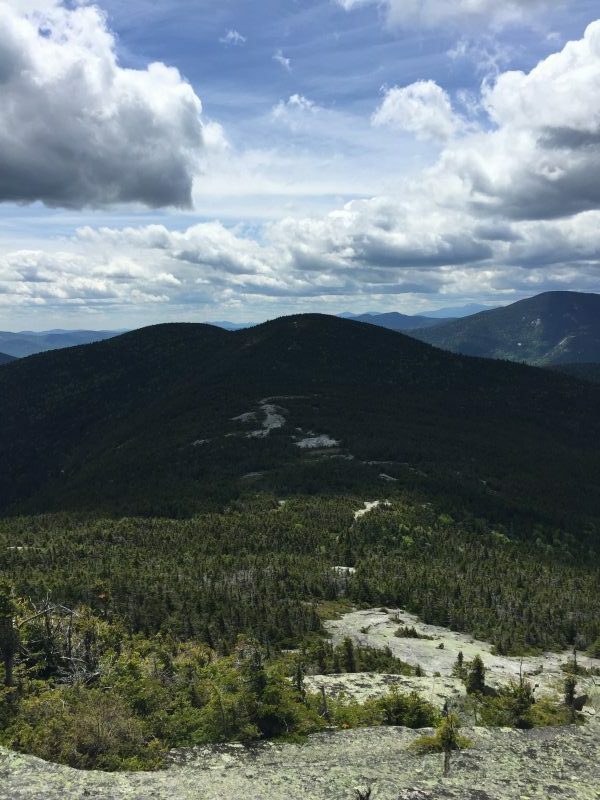 To the south we saw the Baldfaces, scarred and rocky in the sunlight, and the triangular pyramid of Kearsarge North. To the south, crossing the border into Maine, we saw Speckled Mountain nearby and the lakes ringing Pleasant Mountain and the ski slopes. To the north lay the Mahoosucs, Old Speck, the Baldpates and then just to the east, trailing away to the horizon, the High Peaks area of the Crockers and Sugarloaf – next week’s community hike – could barely be seen. All of our community hikes are free and open to the public. Our trip leaders will make sure you have a good time and get out on the A.T. landscape. If you’d like to come along, please sign up here or contact us with any questions! 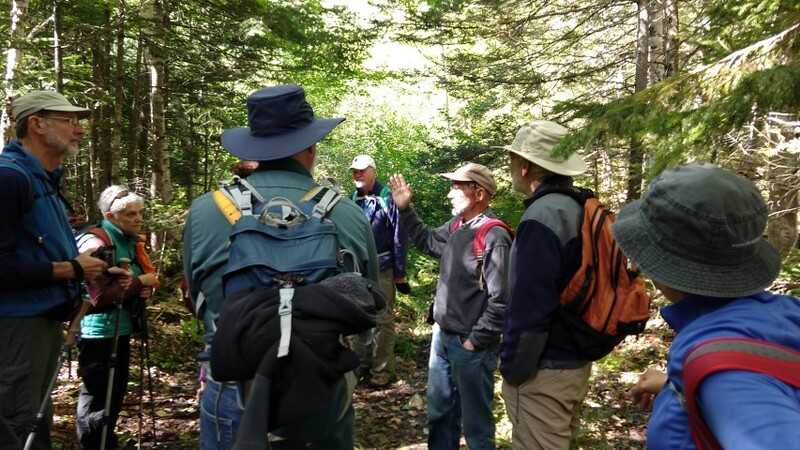 The latest Maine A.T. Land Trust community hike was up Old Speak in the Western side of Grafton Notch. 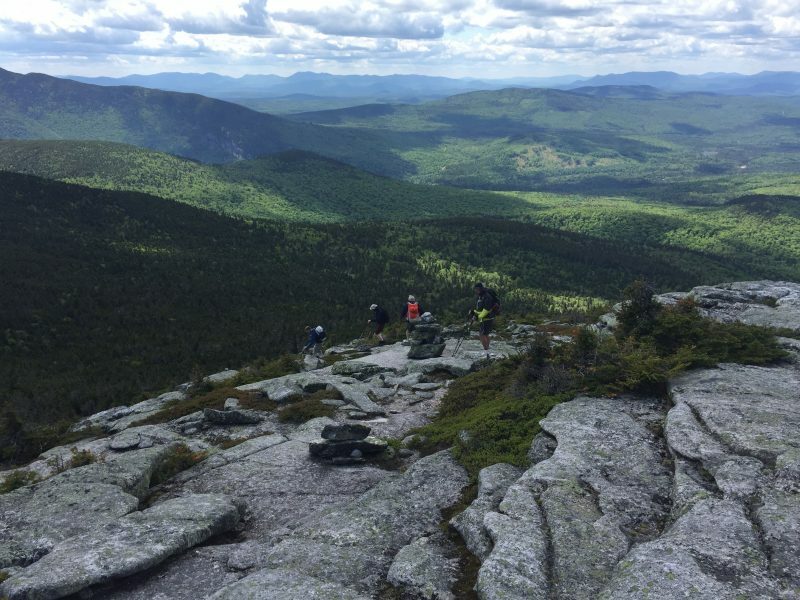 According to the Maine Mountain Guide, Old Speck, at 4,170 feet, was named for its speckled appearance formed by its large areas of exposed rock and tree cover and to distinguish it from other speckled mountains in Maine. 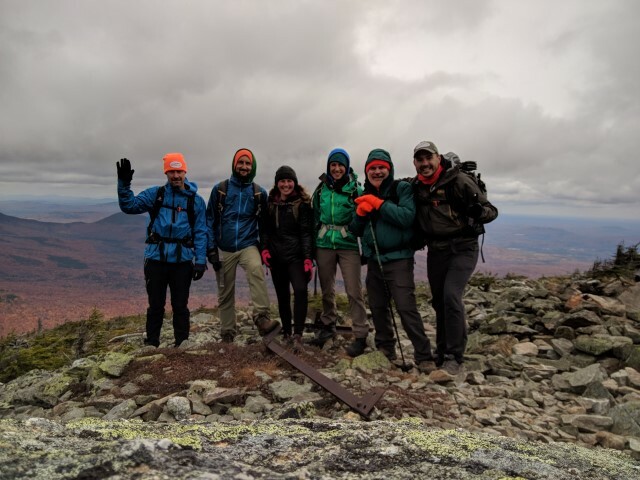 For a long time it was thought to be the second highest peak after Hamlin on Katahdin but now it is known as the fourth highest following Hamlin, Sugarloaf and the north peak of the Crockers. 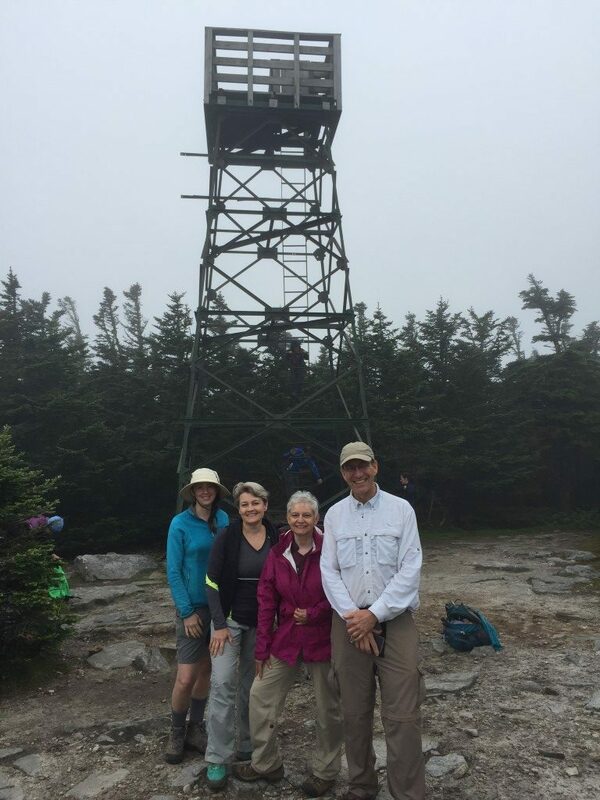 Despite the prediction of a cloud-covered summit and the possibility of rain, four of us headed up the AT in damp, cool and humid conditions. Soon after starting out we came to the trail junction for the Eyebrow, an eyebrow-shaped cliff below Old Speck where the trail loops around to rejoin further up the AT. This was not part of the day’s plan, not to mention it would be slippery and have no views. Another day perhaps. 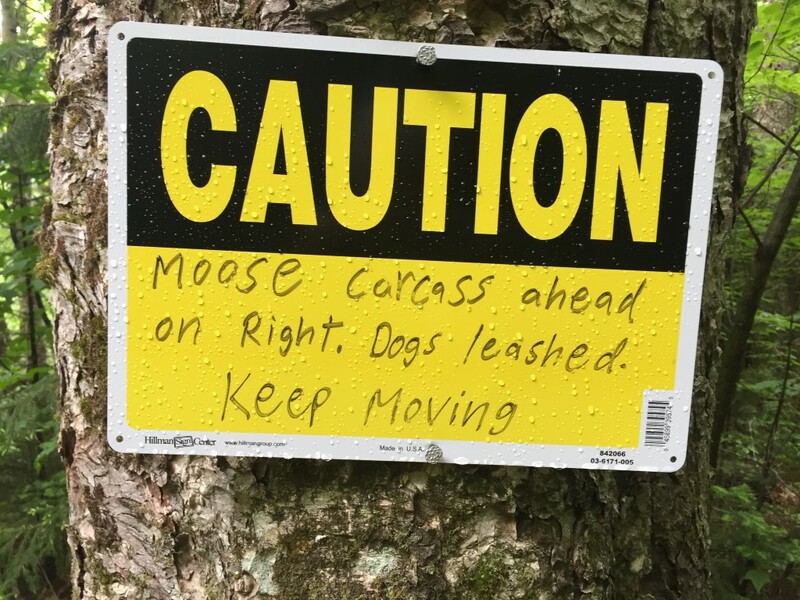 As we traveled along and starting ascending the stone steps heading to the falls on Cascade Brook, we encountered a most awful stench and soon saw a sign indicating that there was a dead moose carcass just off the trail. The maggots lining the footpath and the truly overwhelming odor was not enough to stop two curious members of the group from taking a look. Rest in peace my moose friend. As we continued on we met quite a few through hikers both north and south bound. One pair, heading northbound (also known as NOBO) who had joined up along the way, were known as “Fish Out of Water” and “Prof”. “Fish” is a marine biologist from California so the lack of ocean views on this journey made him feel like, well, a fish out of water! “Prof” is a young man who started smoking a pipe and was told he looked professorial (he ditched the pipe soon after). They were happy to answer the usual annoying questions from day hikers and even posed with us for pictures. Good sports! Summiting found a quite few other day hikers either enjoying lunch or climbing the fire tower where they could only imagine the view they were missing. It is truly spectacular on a clear day. We took our customary group photos, hunted for the “geo” survey marker (short for geodetic) hidden in the bushes on a rock by a cairn – and then headed back down. Descent was uneventful – there were a few more through hikers and day hikers along the way. Although rain was predicated for the late afternoon, the sky actually started to clear a bit and we were able to get a few glimpses of the mountains from the ridges – Sunday River Whitecap stood out quite nicely. All in all, we were quite happy with our hike. 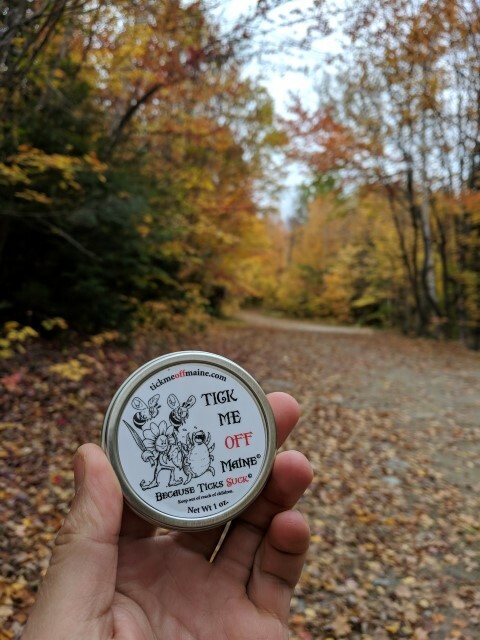 It’s not always about the view – just wandering companionably through the Maine woods with fellow hikers is just as meaningful. Photo courtesy of Phil Coyne. 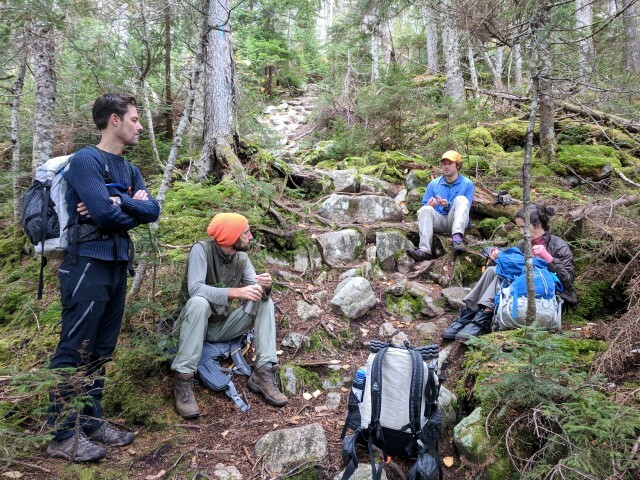 The Maine Appalachian Trail Land Trust hosted its second community hike of the season to Baldpate Mountain in Grafton Notch. 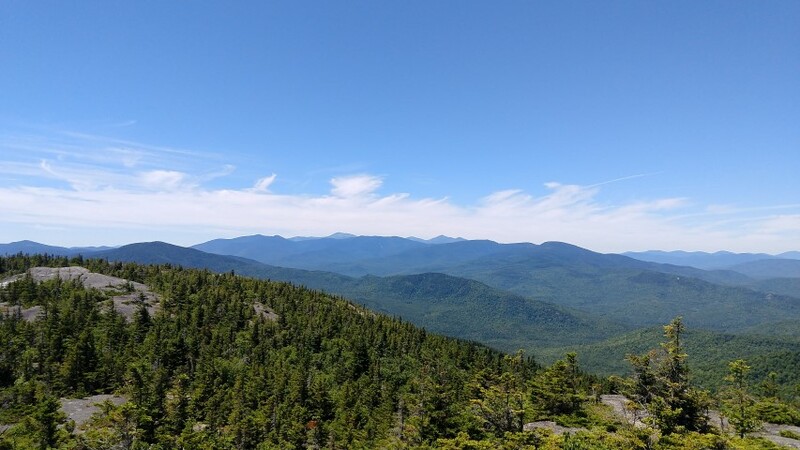 There are two summits: the somewhat wooded West Peak at 3,662 feet and the wide open and beautiful East peak at 3,812 feet. 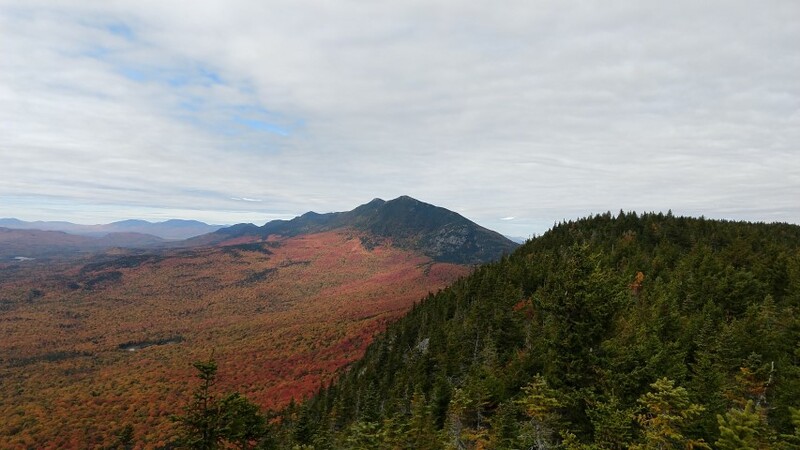 According to the AMC Maine Mountain Guide, these peaks were also known as Saddleback and Bear River Whitecap. 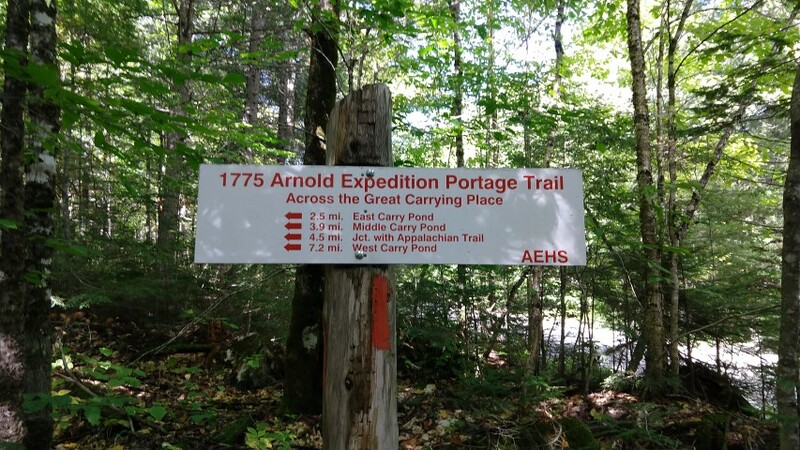 This rugged hike, complete with bog planks, ladders and open bald ledges leads up the AT and starts on the east side of ME Route 26. The morning was cool, crisp, clear and breezy when four guys and a gal met up in the parking lot in Grafton Notch State Park. Two of five had not hiked the Baldpates before and were promised that it would be more than worth the effort. 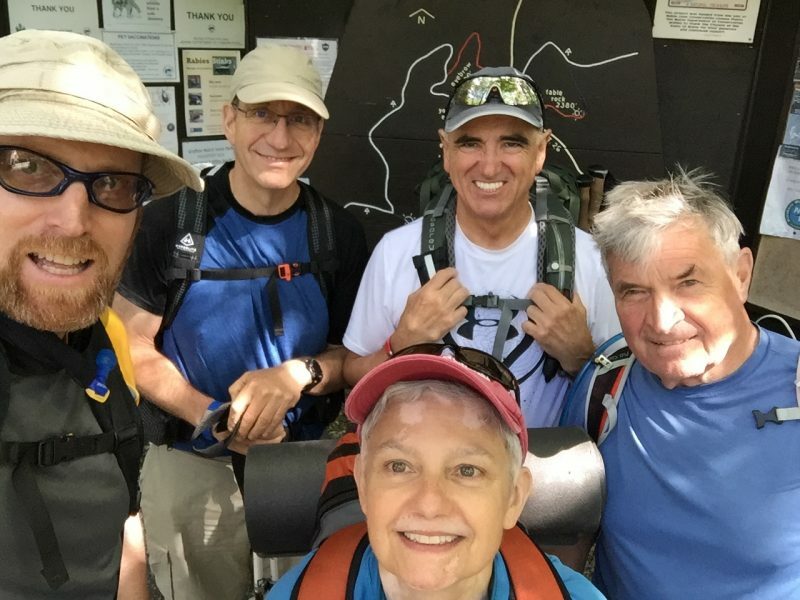 In fact, we stopped at the trail junction for Table Rock, a short rugged side trail with a sign indicating fantastic views, and the question was raised whether we should spend the time to go see them. Although the views from Table Rock are pretty impressive, the views to come would clearly outshine those from Table Rock so we continued on and left Table Rock for another day. It took well over three hours to reach the summit. Along the way we took a .2 mile detour to visit the lean-to and have a quick snack. We took time to photograph the one lone (and more uncommon) white lady slipper next to the trail and the alpine flowers along the boggy areas. Continuing along, the wind picked up dramatically as we ascended over the open ledges to summit the East peak. As promised, the views did not disappoint. 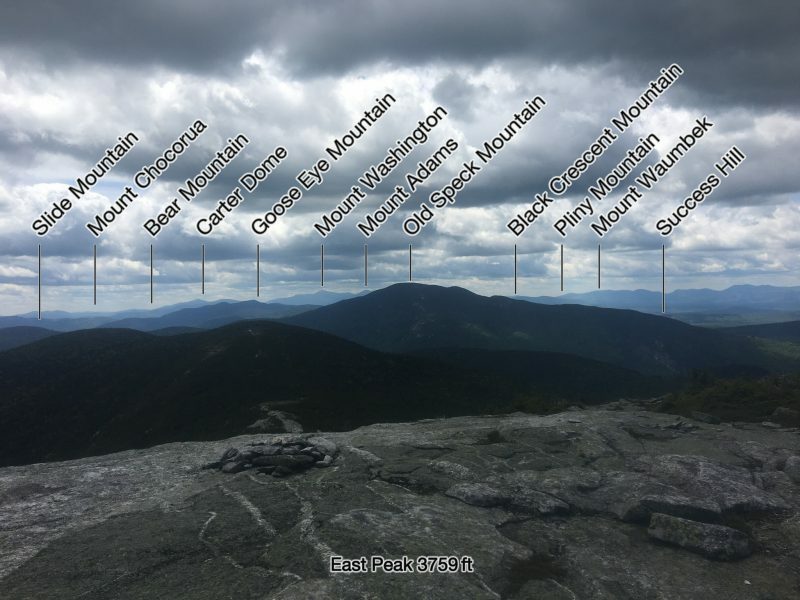 To the southwest you could see as far as Mount Washington and looking northeast you could see as far as Sugarloaf. Lunch was spent enjoying the views (and in a few cases napping) on the eastern end of the summit where it was warmer and less windy. Soon it was time to leave, and reluctantly we headed back down the ledges where the wind had picked up even more and buffeted us around! Fortunately, no one flew off the mountain and upon our return to the parking lot we decided to meet at the Sunday River Brewing Company. We enjoyed a nosh and a beer and reflected on our awesome hike to the Baldpates.